Sikhs have contributed to World war I & II with heavy losses while serving with other allied forces under the commonwealth. In World War I and II, 83,005 Sikhs were killed and 109,045 wounded fighting for the allied forces. 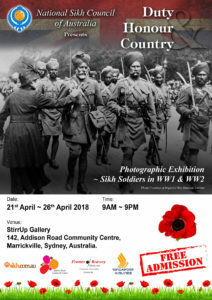 Sikh units fought at the Battle of Saragarhi; in the First World War, as the “Black Lions”, as well as during the Second World War in Malaya, Burma and Italy. The Battle of Saragarhi is considered one of the great battles in Sikh military history. On 12 September 1897 a contingent of twenty-one soldiers from the 36th Sikhs regiment (now the 4th Battalion of the Sikh Regiment of Indian Army), led by Havildar Ishar Singh held off an Afghan attack of 10,000 men for several hours. All 21 Sikh soldiers chose to fight to the death instead of surrendering. In recognition of their sacrifice, the British Parliament paid them respect, and each one of them was awarded the Indian Order of Merit (equivalent to the Victoria Cross). Sikh soldiers also fought in First Opium War and Second Opium War in China. Known afterwards as the Lions of the Great War, during the war they were often called the Black Lions. Sikhs were allowed to use traditional Sikh weapons such as chakrams and talwar swords, and it was not uncommon to see the Sikh holy book, the Guru Granth Sahib, being carried before a marching Sikh battalion or even on the front lines among the battling Sikh troops.